Reliefs from the monument of Eurysaces. 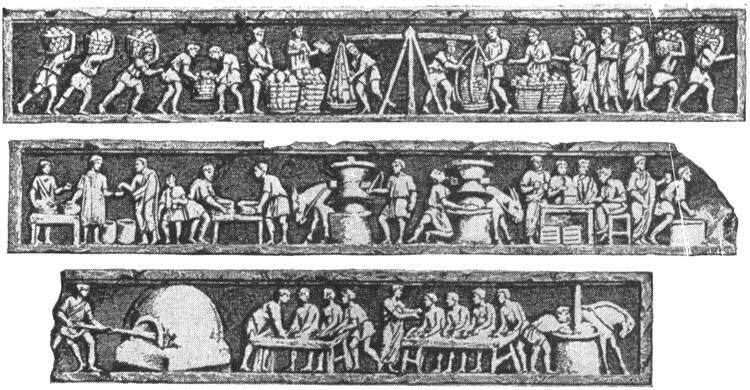 1 — weighing and acceptance of grain; 2 — grinding, sifting of flour; 3 — stirring and rolling dough out, a bread oven. © Photo, text: M.E. Sergeenko. Prostie lyudi drevnei Italii. — Izdatel’stvo “Nauka”. Moskva — Leningrad, 1964, s. 66—67. From: М. Rostovzeff. The social and economic history of the roman Empire, tabl. II.